You probably heard by now, last week in the mountains was all time. 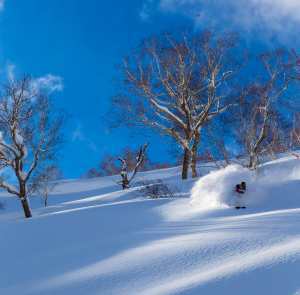 A 70cm snow storm hit, unloading incredibly dry snow with almost no wind to speak of. 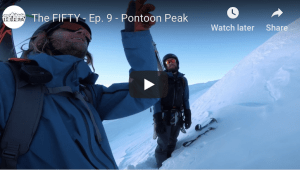 As we were in town hanging with the awesome crew from Carlton Dry, we thought what better way is there to make the most of the perfect conditions than to head out for the season debut of Steve Lee’s Backcountry Tours. 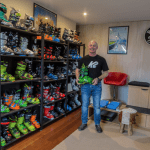 Unfortunately for Steve, a late arrival of his brand new fleet of sleds meant that he was delayed in Melbourne and wouldn’t be on hand to take us out himself. After a quick phone call he assured us that his daughter, Falls local and Mountainwatch Snow Reporter Layla Lee would be around to show us to all the stashes. The day began with breakfast and a briefing down in Falls Creek village. Our crew was an assortment of skill levels, from Backcountry gurus right down to first timers, Aussie surf legend Mark Occhilupo was even making an appearance! 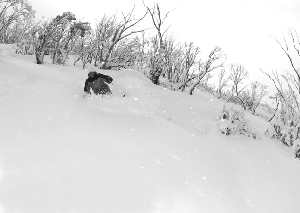 The backcountry in Falls Creek is really diverse, which means that even in average weather there is an aspect sure to hold some good snow. Our morning started by jumping on the sled trailer and being shuttled out to the peak of nearby Mt McKay. Once there, we realised the wind was absolutely howling and we would have to descend into the valley to find some good snow. Once we made the first run we jumped back on the sled trailers and went around to the south face and dropped down in elevation behind the peak. The snow on this side was a vast improvement. We spent the rest of the afternoon getting shuttled up to the top and each finding our own lines down through the pow, it wasn’t super deep, the snowpack had some time to settle after the storm passed. It was dry though, and it was bluebird. 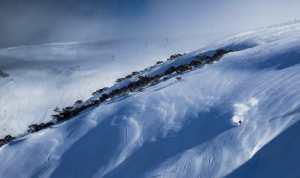 If you’re in Falls Creek this season it would pay to go and speak to Steve and the crew to try and get out and enjoy it. When the snow is on the terrain is incredible. Layla Lee, does she have the best job in the mountains? Occhilupo throwing down some turns, look at that flow, can you tell he is a surfer? Our guide Layla Lee and one of the Carlton Dry Ambassadors, are they flirting?